Brian Brown (Amsterdam 2015) picked up the win after tossing 5.2 innings of one-run ball for NC State on Saturday against Longwood. Troy Scocca (Mohawk Valley 2015) went 3-for-4 with a home run and a double on Sunday for Fairfield. He also went 2-for-3 with a triple in game two of a double header on Saturday. Mike Wallace (Amsterdam 2015) tossed seven innings of one-run ball with five strikeouts to earn the win for Fairfield in game two of a double header on Saturday. Sebastian Salvo (Mohawk Valley 2014) went 3-for-3 with a double and three RBIs in game one of a double header on Saturday for Fairfield. Jake Salpietro (Amsterdam 2014) went 2-for-5 with a home run, a double and three RBIs in game one of a double header on Saturday for Fairfield. Danny Hrbek (Albany 2014) went 3-for-6 with a triple for Radford on Sunday. Caleb Baragar (Amsterdam 2015) picked up the win for Indiana on Sunday after tossing five innings of one-run ball. Casey Rodrigue went 2-for-4 with four RBIs and a double on Saturday for Indiana. He also went 3-for-5 with an RBI on Friday. 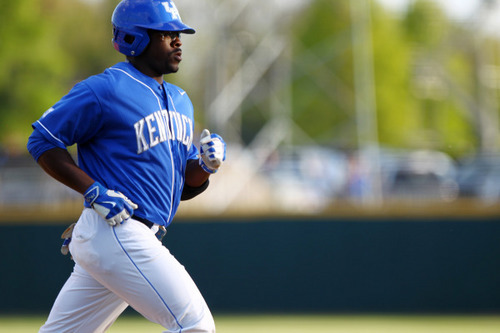 JaVon Shelby (Amsterdam 2014) homered for Kentucky on Sunday. He also homered on Friday. Dorian Hairston (Newark 2014) went 2-for-5 with a home run on Saturday for Kentucky. Thomas Hackimer (Amsterdam 2014) recorded his ninth save of the season on Saturday for St. John’s. Rocky McCord (Amsterdam 2012) earned his fifth win of the season for Auburn on Saturday after tossing allowing one earned run over seven innings against South Carolina. Pat Dorrian (Saugerties 2015) went 3-for-4 with three RBIs and three doubles on Saturday for Herkimer CC. He also went 2-for-3 with two RBIs and a double on Friday. Luke Reilly (Adirondack 2015) tossed six innings, allowing three runs and earned the win for La Salle on Saturday. Brian Dudek (Newark 2015) and Charlie Sobieraski (Newark 2015) both homered for Buffalo on Sunday. Ryan Dorow (Adirondack 2015) went 2-for-3 with a triple and three RBIs on Friday for Adrian. Willy Yahn (Newark 2015) went 3-for-5 with two RBIs on Friday for UConn. Dylan Boisclair (Albany 2014) picked up the win after tossing a scoreless inning for Millersville on Friday. Matt Dacey (Albany 2013) went 3-for-6 with a home run and three RBIs on Sunday for Richmond. Kane Sweeney (Newark 2012) went 2-for-4 with two home runs and six RBIs on Sunday for Morehead State. He also went 3-for-6 with a home run on Friday. Bryce Greager (Watertown 2013) went 2-for-3 with a home run and three RBIs on Friday for Nevada. Jayson Yano (Newark 2014) tossed a complete game, allowing just one unearned run on Sunday for Stevens. He also had two RBIs in the game. On both Friday and Saturday, he went 2-for-3. Samm Wiggins (Newark 2014) homered for Houston Baptist on Saturday. He also had three hits on Sunday. Andrew Sanders (Newark 2013,2014) tossed 7.1 innings of two-run ball in a loss for Ithaca against Stevens on Sunday. Rollie Lacy (Adirondack 2014) continued his strong pitching of late, tossing seven innings of three-run ball in a no-decision for Creighton on Friday. Jonathan Chudy (Cooperstown 2013) tossed a complete game, allowing just one run and striking out eight for Pace on Saturday against Le Moyne. Drew Hercik (Watertown 2014) went 3-for-4 with four RBIs and two home runs on Saturday for East Stroudsburg. Marc Iseneker (Mohawk Valley 2015) picked up the win for St. John Fisher on Saturday after tossing five innings without allowing an earned run. Malcolm Kelsey (Mohawk Valley 2015) homered and went 2-for-3 for St. John Fisher on Saturday. Cedric Mullins (Utica 2014) went 3-for-3 with two doubles on Sunday for Campbell. He also went 3-for-4 with a double on Friday. Mitch Sewald (Watertown 2014) earned the win for LSU-Eunice on Saturday after he struck out eight, walked two and allowed two earned runs on nine hits before leaving one out short of a complete game. Drew Tolson (Albany 2014) tossed eight innings of two-run ball for Baylor in a loss against Kansas on Saturday. Sean Spicer (Albany 2013) notched his sixth save of the season for Baylor on Saturday. For more information on the PGCBL, follow the league on Twitter, @PGCBLBaseball.